History's mysteries aren't just going to up and explain themselves without getting out there and doing a little digging. 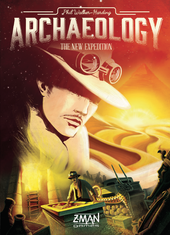 Such is the case with Archaeology, the card game from Z-Man Games. Their card game of finding priceless artifacts and... well... putting a price on them is getting itself a new edition. So what can you expect in this updated version of a game looking for old, lost things? Well, there's new artwork, giving the game a more-modern feel. There's also new artifacts you can find and sell. With new artifacts, you need new places to dig. As such, there's new monuments as well.